Like many web types I have a number of small websites I look after, and I've never been happy with my backup solution. Until today. My requirements are simple, create a backup of the database and files and save it on a local backup drive. The sites don't warrant anything fancy (like a cloud based solution that costs money). The procedure until now involved multiple, fussy steps. It turned out a single script solution is simple once a few key technologies are in place. An example, like a picture, is worth 1000 words. Until recently Drupal programming examples existed but were spread among documentation pages, blog posts, and the Drupal CVS repository; some searching required. That changed in late 2009 with the introduction of the Examples for Developers module. Its purpose: "to provide high-quality, well-documented API examples for a broad range of Drupal core functionality". Now you can find high-quality, working Drupal 6 and 7 code examples in one place, many with SimpleTests. Drupal's scripting abilities just keep getting better and better. Since publishing my Drupal Command Line Script Template last year I've moved exclusively to the Drush php-script (scr) command. The script template article still gets a lot of page views - perhaps because with all the functionality in Drush it's easy to miss the scripting feature - so posting an update seems like a good idea. Drush takes care of creating the Drupal environment for the script to run in, which is the only function the template served. Using Drush factors out the environment common code, eliminating redundant code in individual scripts. Drush makes it easy to place the script files in a directory outside of the Drupal website home directory. Placing script files outside the website home directory eliminates a whole range of security issues. The Drush code that creates the Drupal environment is reviewed by the community, making it far more robust than something a single person could create or maintain on their own. When the code required to create the Drupal environment changes you don't need to update individual templates, just Drush. Anyone who's tried to explain Drupal's content feature-set to the uninitiated appreciates the amount of territory that needs covering as well as the challenges inherent in presentation depth and order. 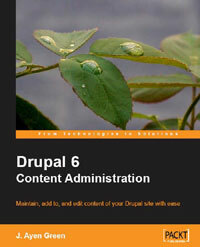 J. Ayen Green takes up the challenge in his book, Drupal 6 Content Administration, published by Packt Publishing. Putting location data on maps, especially dynamically, used to be a dream. No longer. Thanks to open standards, APIs, Internet based map web services, and many hours of work in the Open Source community, a new wave of options are available for putting location based data on maps. And Drupal is surfing this wave! The LinksDB module provides a nice "it just works" way for implementing a classic Links page. The standout feature is its hierarchical display of the URLs. Even after Views and CCK arrived, the hierarchical display was worth staying with the module. Sadly, with a site to upgrade and no Drupal 6 version of LinksDB in sight, it was time to convert. The LinksDB module provides a nice "it just works" way for implementing a classic Links or Resources page. 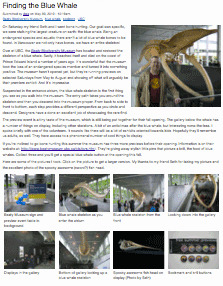 The standout feature is its hierarchical display of the URLs. Even after Views and CCK arrived, the hierarchical display was worth staying with the module. Sadly, with a site to upgrade and no Drupal 6 version of LinksDB in sight, it was time to convert.